"Tagel" is Swedish for the fibres from horses' tails and manes, the tuft of cows' tails. Etymologically, it is the root of the English word "tail". 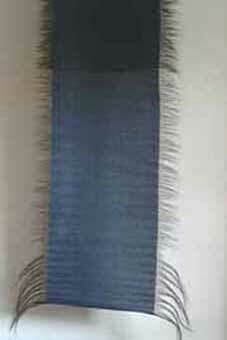 For weaving, the hairs are used "as is" (ie not spun). This means the maximum width of the web is determined by the length of the fibres. Historically, it is not uncommon (in Sweden) to find upholstery fabrics of horsehair from the early 1800s and forward. Horsehair fabrics are very hard-wearing. The fabrics were woven both patterned and plain. Here is an article (in Swedish, but it has pictures) about a fabric found in Smålands museum. 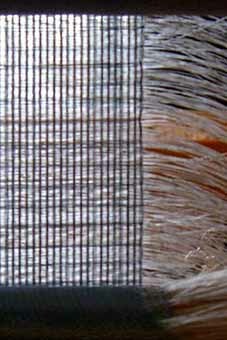 Click here for an article about horsehair fabrics and how to weave them. One of the few European mills that still weave industrially with horsehair is John Boyd Textiles in England. Clothing can be made of horsehair fabric, too. 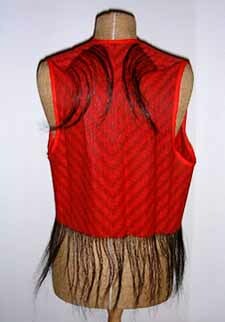 The waistcoat has a cotton warp, (natural) black horsehair for weft. Below is a detail of the fabric, to the right is the back of the waistcoat. A jacket with inspiration from the 17th century was given a standing collar of horsehair. 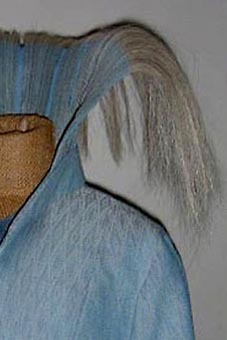 The fabric is elastic, and the white horsehair hangs towards the back like a fringe. 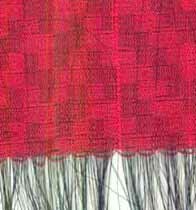 I weave horsehair fabrics to order. Prices from SEK 5000 per meter, minimum order 2 meters. 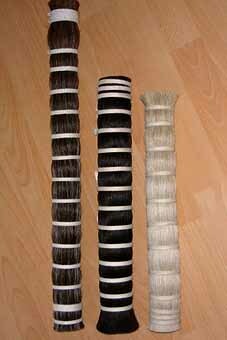 I also sell horsehair for weaving - contact me for available lengths, colours and prices.